We’d love your help. Let us know what’s wrong with this preview of Debutante Hill by Lois Duncan. Louis Duncan's 1958 young adult classic tells the story of what happens when the debutante tradition comes to one small town: the parties, the ball gowns, as well as one girl's growing sense of right and wrong. Lynn Chambers is popular, wealthy, and going (almost) steady with a handsome college boy. But when she decides not to be a debutante, Lynn finds herself on the outsi Louis Duncan's 1958 young adult classic tells the story of what happens when the debutante tradition comes to one small town: the parties, the ball gowns, as well as one girl's growing sense of right and wrong. Lois Duncan was a young wife and mother of two when she decided to write a novel to pay the bills. The result was Debutante Hill. The novel was originally rejected for consideration in the Dodd, Mead and Company's Seventeenth Summer Literary contest due to one character drinking a beer, but after Duncan swapped in a soft drink, she won the prize, which paid the down payment on her first house. To ask other readers questions about Debutante Hill, please sign up. A 1958 reprint of a coming of age novel about a wealthy young girl who spends her senior year with her well-to-do "Hill" friends and waiting for letters from her handsome college boyfriend, until the tradition of debutantes descends on her small town and her father forbids her to participate. Lynn is suddenly aware of her peers in other social classes, and begins to form strong opinions about prejudices in her town and rethinks the relationships with everyone she's known all her life. While a bi A 1958 reprint of a coming of age novel about a wealthy young girl who spends her senior year with her well-to-do "Hill" friends and waiting for letters from her handsome college boyfriend, until the tradition of debutantes descends on her small town and her father forbids her to participate. Lynn is suddenly aware of her peers in other social classes, and begins to form strong opinions about prejudices in her town and rethinks the relationships with everyone she's known all her life. While a bit preachy in places, Lois Duncan's (I Know What You Did Last Summer, Hotel For Dogs) first novel has characters that ring true and enough action and romance to move it along. I can see why it sold well in its day, but I have to confess that what brought this novel to four stars for me was how (unintentionally) hilarious melodramatic 1950s teens are (How thrilling that my feminine charms might wield enough power over bad-boy Dirk Masters to turn him from his rough crowd! ), and how interesting the social mores of the 1950s are (If you have a fellow's class ring, you're apparently still not exactly going steady, and it's totally acceptable to chat with him about other boys you're dating while he's out of town. And remember, girls, a real lady is always kind to the less attractive debutantes, otherwise know as "the less fortunate".) I giggled and cackled my way through the story and enjoyed myself thoroughly. Don't skip the intro. Lois Duncan was clearly the most fantastic child ever. Huzzah! Lois Duncan's first novel is back in print, thanks to Lizzie Skurnick books! Duncan's regular readers might be surprised; no dead teachers make an appearance, no ghosts, no evil ghosts lurking about the fringes. However, something else is lurking: the structure of class, and the difference between haves and have nots. Lynn Chambers is a girl of her times: she has good friends, an irritating little sister, a boyfriend who just went to college but she gets to wear his ring around her neck. Huzzah! Lois Duncan's first novel is back in print, thanks to Lizzie Skurnick books! Duncan's regular readers might be surprised; no dead teachers make an appearance, no ghosts, no evil ghosts lurking about the fringes. However, something else is lurking: the structure of class, and the difference between haves and have nots. Lynn Chambers is a girl of her times: she has good friends, an irritating little sister, a boyfriend who just went to college but she gets to wear his ring around her neck. At the start of her senior year, she finds out that a woman has decided to have a debutante season in Rivertown. All the upper class girls in Lynn's circle are thrilled. Lynn is beyond excited. However, her father puts his foot down: no daughter of his will be a deb. For the first time in her life, Lynn is an outsider. As I was reading this, I was constantly reminded of NICE GIRL FROM GOOD HOME (Fran Arrick) which I had read first although it had been published much later. How many of you who have read both would agree? What did I actually think of DEBUTANTE HILL? I liked it. It was interesting to read a nonthriller from a thriller author. I grew up on Lois Duncan’s horror books from the 80’s and 90’s, and have always been a big fan of hers. I’ve had Debutante Hill on my TBR list for a while now, and decided to finally read it after hearing of her recent passing. I really enjoyed this first novel of hers. Written and set in the 1950’s, it was a nice look into the lives of teens and social classes of that time period. The characters all felt real, and even though the story was authentic to the 1950’s, the message of the book wasn’t I grew up on Lois Duncan’s horror books from the 80’s and 90’s, and have always been a big fan of hers. I’ve had Debutante Hill on my TBR list for a while now, and decided to finally read it after hearing of her recent passing. I really enjoyed this first novel of hers. Written and set in the 1950’s, it was a nice look into the lives of teens and social classes of that time period. The characters all felt real, and even though the story was authentic to the 1950’s, the message of the book wasn’t dated and is still meaningful in the world we live in today. First published in 1957, this was reprinted a few years ago. It's Duncan's first book, and she notes in a foreword that she originally wrote it as a short story: she turned it into a book after an editor told her that it was too much story for a short story. For readers who grew up with Duncan's I Know What You Did Last Summer, this is quite the change of pace. No murder, nothing supernatural...just a relatively quiet story about a girl from a 'good' family who must learn a lesson about class an First published in 1957, this was reprinted a few years ago. It's Duncan's first book, and she notes in a foreword that she originally wrote it as a short story: she turned it into a book after an editor told her that it was too much story for a short story. For readers who grew up with Duncan's I Know What You Did Last Summer, this is quite the change of pace. No murder, nothing supernatural...just a relatively quiet story about a girl from a 'good' family who must learn a lesson about class and perception. I'm giving this four stars because I found it so fascinating. It's not without its problems, though. Modern readers will notice that 'diversity' in the book extends only as far as how much money the white characters have (note that the modern cover includes a few black men, all of whom are clearly in blue-collar-worker roles); there's something of a rich-white-saviour aspect to one of the book's conflicts; there's never really any suggestion that Lynn (the girl from the 'right side of the tracks') might actually end up with Dirk (the boy from the 'wrong side of the tracks'), because that would be a bridge too far. It's a reflection partly of the times, I think, and partly of Duncan's youth and relative inexperience at the time of writing. To Lynn, the protagonist, it's genuinely mind-blowing to realise that people outside her narrow, privileged social circle can also be good people, smart people, people worth knowing. It feels realistic that there's a limit to how far Lynn's changes, over the course of the year, can stretch, and I appreciate that she grows aware of her privilege throughout the story: that even though all her friends are 'coming out' as debutantes and she's not (her father doesn't approve of coming out, as he thinks debutante activities are classist), she has access to privileges that lower-class girls don't. Among other things, Lynn is never ostracised: her friends are sorry she can't participate, and Lynn often does end up feeling left out, but it's not intentional. In a contemporary story, I'm not sure this would be the case; I think it's likely that a lot of the plot would revolve around a 'mean girl' from either side of the tracks. Lynn Chambers is a bit excited that a debutante season has been arranged by the unfortunate Brenda's mother, especially since her beau, Paul Kingsley, is off to college. The parties will give her something to do during her senior year. Unfortunately, her father, who is a doctor who ministers to everyone in town, including the poor, tells her that she will NOT be going to the parties, because they will serve only to socially divide the town even further. This is a bummer, because all of her frien Lynn Chambers is a bit excited that a debutante season has been arranged by the unfortunate Brenda's mother, especially since her beau, Paul Kingsley, is off to college. The parties will give her something to do during her senior year. Unfortunately, her father, who is a doctor who ministers to everyone in town, including the poor, tells her that she will NOT be going to the parties, because they will serve only to socially divide the town even further. This is a bummer, because all of her friends ARE going to the parties, and Brenda even gets Paul to take her to some. Understandably upset, Lynn manages to get herself invited out by the poor and dangerous Dirk, who takes her out to a road house and is generally a bit rude to her because she has money and he doesn't. Lynn does start to understand a bit what it is like to not have the advantages that she has had, and her sister Dodie, with whom she hasn't gotten along, shows her that just because people are Not Our Kind doesn't mean that they are bad people. Except for maybe Dirk, who falls head over heels with Lynn, gives her his mother's jewelry, and then generally acts dysfunctional. Strengths: This is a fascinating look at this time period. I bought a copy to go with The Outsiders unit, and I think it would be good to read in preparation for that book, since it predates it. It's by Lois Duncan-- her first work, in fact, and one for which she won the Maureen Daly Seventeenth Summer First Novel competition. It's forward thinking for the time (and I collect teen novels from this period, so have read a lot), and holds up well even today. The best part, however, is the level of detail about everyday life at the period that a modern book would never begin to match, from the father calling Lynn "Daughter" to the clothes for dates, lingo, etc. Very fun to read. In a time when people like to lampoon the dilemmas of well-off people with lists and hashtags like #richgirlproblems, Lizzie Skurnick Books re-issues Lois Duncan’s first novel about a wealthy girl whose eyes are opened to the class divides she’d never considered in her hometown. While she was somewhat aware of the stratified nature of her high school, the bigger implications of this don’t dawn on our heroine until she finds herself on the outside of the popular crowd. 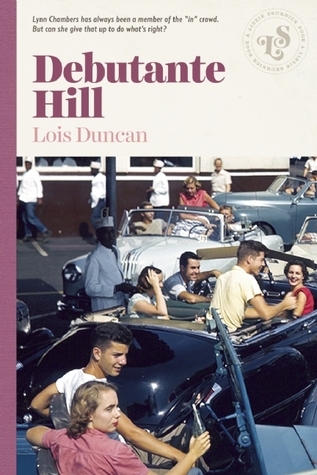 For this edition, Duncan (o In a time when people like to lampoon the dilemmas of well-off people with lists and hashtags like #richgirlproblems, Lizzie Skurnick Books re-issues Lois Duncan’s first novel about a wealthy girl whose eyes are opened to the class divides she’d never considered in her hometown. While she was somewhat aware of the stratified nature of her high school, the bigger implications of this don’t dawn on our heroine until she finds herself on the outside of the popular crowd. For this edition, Duncan (of I Know What You Did Last Summer fame) wrote a wonderful introduction, detailing the process of writing the book and the beginnings of her publishing career. Another in the Lizzie Skurnick series-this is the first book Lois Duncan ever wrote, and it's an impressive debut. Yes, totally dated, but the sort of thing I love. Lois Duncan's first novel. Clearly already trying to balance her own tendencies toward the violent and sordid with the genre expectations of '50s teen romance, though inclining toward the latter. I guess she got that out of her system (after The Middle Sister and the Joyce books), because she gave up that effort entirely a few years later. This reads like a Cleary or du Jardin with a dash more realism. The 2013 intro by the author almost makes up for the glut of OCR errors in the text. I came across this book a few years ago when I was absolutely enthralled with the 1950's era, and looking to read anything from the time period I could get my hands on!! I wish we had more books like this today!! It resonated with me and reminded me of times in my teen years when I didn't go along with the crowd, and how it was hard sometimes to be set apart, or the 'odd one out'. I had anticipated a completely different direction to the ending, and was pleasantly surprised when it ended how I h I came across this book a few years ago when I was absolutely enthralled with the 1950's era, and looking to read anything from the time period I could get my hands on!! I decided a while ago to read all of the Lizzie Skurnick Books titles, because Lizzie Skurnick has excellent taste and I love what she's doing, bringing back older YA books that have fallen out of print. This one, for example, was published in 1958. 1958! I didn't even know Lois Duncan was writing back then. I grew up loving her paranormal thrillers published in the 70s and 80s, and while this book contains no magic or psychic powers, it's every bit as good as those. The themes in this book hold I decided a while ago to read all of the Lizzie Skurnick Books titles, because Lizzie Skurnick has excellent taste and I love what she's doing, bringing back older YA books that have fallen out of print. This one, for example, was published in 1958. 1958! I didn't even know Lois Duncan was writing back then. I grew up loving her paranormal thrillers published in the 70s and 80s, and while this book contains no magic or psychic powers, it's every bit as good as those. The themes in this book hold up surprisingly well for being half a century old. Lynn is part of a group of popular rich kids, and the girls all want to be debutantes. Lynn's father says no, though, because he doesn't want Lynn to be part of something that divides people along class lines. Lynn is upset at first, but when she can't go to the debutante events, she starts talking to people outside her social circle, and discovers there's more to them than she's always thought. When Lynn starts dating bad-boy Dirk, I was expecting this to turn into a romance between rich girl and poor boy, but the direction it did take instead surprised and pleased me. Lynn had thoughts of being able to reform Dirk and put him on the straight and narrow, but she eventually realized that that wasn't up to her, it was up to him. Nobody in this book is condemned for being who they are, and most of them, even the "villain," are given sympathetic reasons for what they do. The relationships between characters evolve realistically throughout the book. I especially liked the relationship between Lynn and her sister, Dodie, who starts out as the bratty little sister but ends up a fiercely loyal ally who actually has some things to teach Lynn. Dodie deserves her own novel. This is a story about a rich white girl learning about her privilege, which I understand is not a story everyone wants to read, but I really liked it. A couple of notes about this version: I love Lizzie Skurnick Books's cover designs, and the font is delicious, but there were a lot of typos. Like, a lot. Missing punctuation, a couple of misspelled words, and even a 1 instead of a capital I at one point. Step up your game, dudes. Debutante Hill was the first book to be reissued by Lizzie Skurnick Books. Though Lois Duncan is best known to people of my generation and younger as a writer of teen thrillers, this book does not fall into that genre. Published in 1957, it is the story of high school senior Lynn Chambers who is at the center of the popular crowd of kids who live on the Hill. When it is announced that the mother of one of the less-popular girls has decided to This review also appears on my blog, Read-at-Home Mom. I was torn between rating this three or four stars, but I think I'm going to go with four. On the one hand--the three-star hand--the structure of this book is kind of disappointing. Duncan has the setup for a lot of class-based conflict in the arrival of a debutante tradition, but almost all discussion of it happens off-screen. She has the option of having Lynn make new, diverse-by-1957-standards friends (a Jewish girl and a Spanish Catholic girl are pretty different from the Hill's WASP-y in-cro I was torn between rating this three or four stars, but I think I'm going to go with four. On the one hand--the three-star hand--the structure of this book is kind of disappointing. Duncan has the setup for a lot of class-based conflict in the arrival of a debutante tradition, but almost all discussion of it happens off-screen. She has the option of having Lynn make new, diverse-by-1957-standards friends (a Jewish girl and a Spanish Catholic girl are pretty different from the Hill's WASP-y in-crowd), but instead, she only really develops two non-Hill friends over the course of the book. "AVERIL couldn't have married MAURICE. He was bad." "She'd have reformed him. You can reform a man; you can't reform a jelly-fish, of course. Paul isn't a jellyfish, but I liked Dirk so much better than him. I felt like we got a better idea of who he was and why he and Lynn might be sweet together. On the other, four-star hand, what the book actually is is still enjoyable. The characters grew on me way more than I expected, and I was really invested in where the story was going. I appreciated that everyone (save, I suppose, for Brad) had a little good in them; even Dirk, who Duncan later described in at least one interview as the "villain" of the book, wasn't really a bad boy. He was just the wrong boy for Lynn. And while I obviously would have preferred it if the two of them got together, I thought the reasons that they didn't made a lot of sense in context. Even poor, mousy Brenda Peterson (who's a great forerunner to Carrie White, in personality if not in circumstance) genuinely touched me by the end. I loved reading this. I haven't read a ton of pre-80s teen fiction, and honestly it isn't that different? Except for what is being portrayed. And you always think that contemporary historical fiction (as in, historical fiction written now) is going to be pretty accurate, but there are some things in here that I feel could only have been captured by Lois Duncan at the moment she wrote this. For instance: the parents, and how the father takes a stand and the mother supports it but they also kind o I loved reading this. I haven't read a ton of pre-80s teen fiction, and honestly it isn't that different? Except for what is being portrayed. And you always think that contemporary historical fiction (as in, historical fiction written now) is going to be pretty accurate, but there are some things in here that I feel could only have been captured by Lois Duncan at the moment she wrote this. For instance: the parents, and how the father takes a stand and the mother supports it but they also kind of waver on the post? It's not a simple choice for them, and that's clear. For instance: The...bar? And the car, and the movie house. And what all of those things signify. For instance: The idea that you and a boy could be like, yep, I am YOURS, but then you could still date? If he was off at college? That actually blew my mind, you guys. I believe it, but it blew my mind. it's only been a few days since I read this novel, but I've already forgotten most of what it was like to read. I think it was batty enough to be some fun (especially in the beginning before Lynn [possibly not even the correct name] realizes that it is no coincidence that the Hill (read: rich) kids are at the center of everything worth doing at old Calvin Coolidge High [most certainly not the correct name]. my expectations have been ruining my reading all year, but I just can't let them go. goin it's only been a few days since I read this novel, but I've already forgotten most of what it was like to read. I think it was batty enough to be some fun (especially in the beginning before Lynn [possibly not even the correct name] realizes that it is no coincidence that the Hill (read: rich) kids are at the center of everything worth doing at old Calvin Coolidge High [most certainly not the correct name]. This book is definitely a 1958 book. The language made me chuckle. VERY different from any Lois Duncan I've previously read. A sweet book, but not one that I'll re-read. It was a steal at amazon (might have even been free! ), so it was worth it even if it cost a few dollars. I found it interesting to read about the kids on The Hill. There are still cliques like this. And there are still times when people manage to look outside of their cliques and see there are good people in other groups. YA fiction circa 1958. A young woman struggles with social issues when her father refuses to let her be a debutante in her senior year of high school. Lois Duncan's, author of I Know What You Did Last Summer, first novel. I'm so happy this book got a re-issue! It's always nice to read about teenager-dom in a more innocent time, with problems that are relatable but still reflect a different generation's values. I love the peek into what it would have been like to have been a teen in the 1950s and really appreciated Duncan's smartly-written characters and plot lines. Yay Lizzie Skurnick books - good choice for your first release! Preppy YA from the fifties - debs, cliques and going steady. Pretty cute witnessing the birth of a genre, and the birth of teenagerdom as we've come to know it. Not very memorable, but weirdly familiar and comforting. A fun trip back in time. I can see how in 1958 this book would have been considered slightly scandalous and thought provoking. For 2015, it's a cute tale, but still sheds light on class relations 50 + years ago. Found this at a library sale years ago and thoroughly enjoyed it. Glad this has been reissued (thanks Lizzie Skurnick! ), so that others can discover it. This was one of my favorite books from my Jr. High years and it is one of the few books I read more than once. Lois Duncan (born Lois Duncan Steinmetz) was an American writer and novelist, known primarily for her books for children and young adults, in particular (and some times controversially considering her young readership) crime thrillers. Duncan's parents were the noted magazine photographers Lois Steinmetz and Joseph Janney Steinmetz. She was born in Philadelphia, Pennsylvania, but grew up in Saraso Lois Duncan (born Lois Duncan Steinmetz) was an American writer and novelist, known primarily for her books for children and young adults, in particular (and some times controversially considering her young readership) crime thrillers. Duncan's parents were the noted magazine photographers Lois Steinmetz and Joseph Janney Steinmetz. She was born in Philadelphia, Pennsylvania, but grew up in Sarasota, Florida. Duncan started writing and submitting manuscripts to magazines at the age of ten, and when she was thirteen succeeded in selling her first story.